Another exclusive peek into the MH3 Diary ~ stick with me and I will tell you all about our escapades! Today's run was an 8 km asphalt jungle, an urban trail leading us on top and underneath the highway and low way, scoring an average of 8 on Rosemarie's scale and ending in a delightful little picnic spot next to a stream with lush green grass and white ducks. Thanks to Dodocop's courtesy we even passed by Ebene shopping centre so all the girls could make a toilette stop and Bob could feed his cash flow from the atm machine. Truly a yuppie and happy hash indeed. We were missing a lot of hashers today, our Supremous Blobus and Peter our RA for rent, Henriette our Ha$h Ca$h and Rey our paparazzo, David and Juliette together with all the rest that didn't come, but that didn't deter us from having a SUPERB time and all the more to share with all you missing hashers next time. Don't stay away too long pleeeeeeeeease!. Our Honorary Trailmaster Alan was also two timing and multitasking as GM today ~ great to see him in his very special hat, the explanation for the 3 balls is as follows ~ Yesterday England won at rugby, football and cricket ~ whoa! Go get'em boys! As you can see, and coached by Captain Nemo, I tried to get in all his balls. Jackie, Martin, Tusia, Jacqueline, Zan, Vanessa, Gary, David, Gertrude, Gerard, Sasha, Catherine, Harry, Beth, Jenny, Claudia....... and the list goes on..can you see it's fading all together? And last but not least CLAUDIA…who actually got a double D~D because she had a bottle between her legs, and like a good girl she sprayed beer on the RA for having such a dirty mind so he wanted to give her a TRIPLE D~D! Hey dude, leave some beer for the rest of us! So along came the time for a proper RA Joke of the day. So there you go! 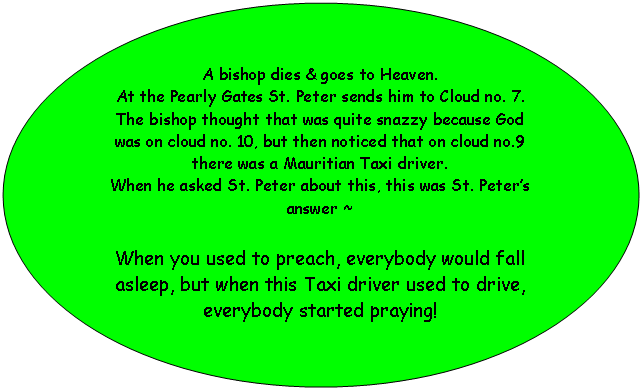 Those who have been in a taxi or behind a taxi should know what St. Peter was talking about. Kevin decided it had to go to Gang, the gentleman who represents the law but did nothing wrong, so he got his infamous smelly beer shower that the Smelly Blue is notorious for! Hey G, you are a good sport! 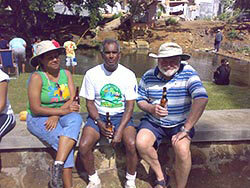 Talk about Blue, look what we found in the stream, a fresh-water BLUE Camaron! Thanks to our foodie brigade, Priscilla and family filled our tummies to the brim & we even had home-made almond sweeties ~ yum yum yum. Our next run will be in a fortnight and it might be set by Alan and David…..in an undisclosed location, so watch this space I am sure all will be revealed in no time, and it will be another day of parcels filled with fun!